For when that day comes, the world must begin to look for a new life. And it is our hope that they may find it here. For here, we shall be with their books and their music, and a way of life based on one simple rule: Be Kind! Spoiler Warning: I will talk about the plot in full detail and spoil many things so if you don't wish to hear spoilers then find the movie and watch it. I don't often say this for a movie but I will here. Let's get back to basics shall we? I originally started this series to show people some excellent or interesting television and movie choices that I don't ever really hear people talking about that much or has dropped off the radar for many. Today's entry certainly fits that category as I have literally never heard anyone speak of this film in my life with the exception of my father who introduced me to it. 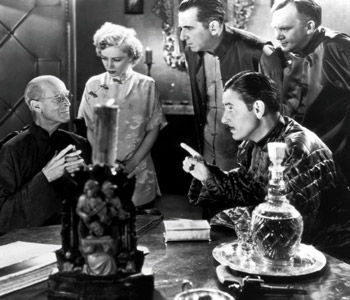 This may be simply due to the fact that this film originally debuted in 1937. There are a large number of people today who are turned off by older black and white film when they really shouldn't be. Several of my favorite films are in black and white and you should really give the older movies a chance especially some of the great ones that I hope to eventually cover on here. Robert Conroy, a writer, soldier, and diplomat, has been sent to Baskul, China to rescue 90 British citizens from an invasion before returning to England. 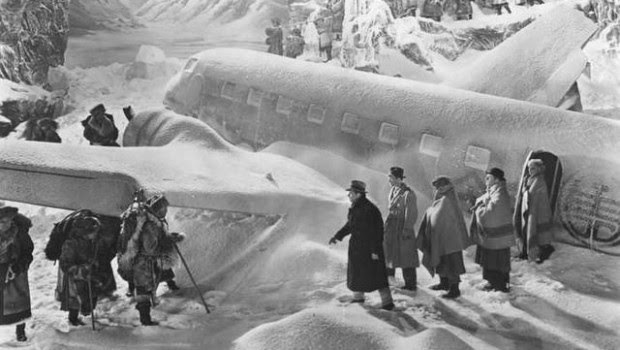 Having successfully gathered each person into a plane, Robert along with his brother George, a paleontologist Alexander Lovett, a swindler Henry Barnard, and a terminally ill woman Gloria Stone board the last plane headed towards Shanghai to eventually arrive back in England unknown that someone has hijacked the plane and is taking them towards Tibet instead. After some time, the plane runs out of fuel and crashes into the Himalayan mountainside which kills the pilot on impact. The next day a man named Chang and his men appear with ample clothing and and supplies; they take Conroy and the others towards their home, Shangri-la, a fertile valley protected from the cold and harshness of the surrounding area. Conroy and his companions are treated with the utmost kindness although information about their whereabouts seems to be quite difficult to muster from people. The only information they receive is that there is no contacting the outside world except for a caravan group that appears every few years when the weather is agreeable for travel through the mountains. As they slowly learn more of Shangri-la they find that there is no crime here and that everything is in excess though the people maintain a believe of being moderate in all things to remain happy in abundance. What is more peculiar than the extreme happiness of the people is that the terminally ill Gloria, who was told she only had 6 months to live, was starting to get better simply by being in Shangri-la. Robert meets a beautiful woman named Sondra and beings to form a relationship with her. Slowly the other people gain happiness and understanding as the paleontologist begins to teach the children, and the swindler who was a plumber before the 1929 Stock Market crash begins designing plumbing for the entire valley. Everyone is finding happiness except for George who can't wait to get back to the world he knew and refuses to believe all is as well as it seems, which is in part fueled by a woman named Maria who wishes to leave Shangri-La. Chang says Maria arrived in the 1800's but she claims to only be 20 and arrived 2 years ago. This will become important later. Eventually, Robert meets the leader of Shangri-la, the Head Lama, who explains that Robert was chosen specifically for the ideas written in his books and papaers to become the new leader of Shangri-la, hence the hijacking. The current leader tells Robert that he was a priest who found the valley in the 1700's and due to the wonderful properties of the valley has been living and leading the people for at least two hundred years! The Head Lama's time to die had finally come he passes quietly as he hands over Shangri-la to Robert. George and Maria insisted that this was absolute madness as there was no way a man could live that long; Maria adding that she wanted to get away from that crazy old man. I'm giving you a moment to not read the following paragraph. This film has the wonderful quality to be perceived slightly differently if you view it not knowing what's going to happen VS viewing it when you do know. I'll give you a moment to decide if you want to know or not If you do not wish to know what happens in the end of the movie skip on to the "What's Good About It" section. 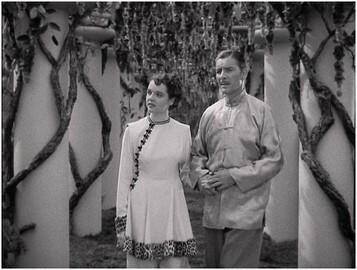 That same day, the caravan appears and George and Maria have secured passage away from Shangri-la though the others wish to stay. George pleads with Robert to leave this insanity behind. Maria helps George by telling her side of the story of how she truly was only 20 years old. 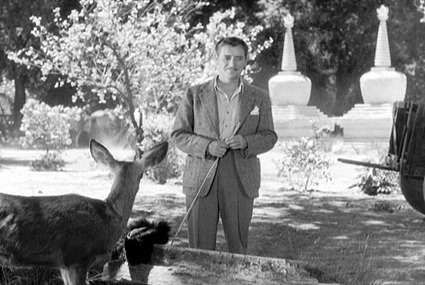 Weighing the facts before him Robert chooses to leave Shangri-la with George and Maria. As they are traveling, Maria collapses from exhaustion. Getting her to a cave, George and Robert turn Maria over to find that she had grown extremely old and died instantly. Leaving Shangri-la had removed the special blessings keeping her young which meant everything being told to Robert was true. Losing his sanity at the sight of this, George throws himself from the mountain to his death. Robert spends the next 10 months trying to find his way back to Shangri-la to take his place among the people he grew to love and the very last scene of the movie is Robert finding the gates once more. 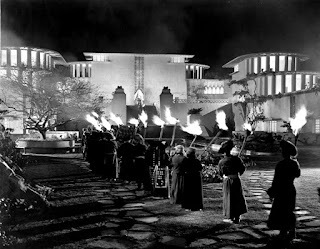 You can easily tell where all the money went to because even for this old of a film, the sets, models, designs, and costumes are all rich and wonderful. You really get the feeling that you are watching something grand, something important. It's the attention to detail both on a large and small scale that make this something worth watching in and of itself but that's nowhere near the beginning of the praises for this film. One of the biggest strengths of this film is the ideology and themes provided within. It is a universal theme that sat well with the audience of the time but has aged well and become even more profound with that of today's society. The thought that the outside world is getting worse and trying to kill itself was definitely true in the times leading to World War II, but think of how "bad" the world has gotten since then. Compare that with the lifestyle and vision of that of Shangri-la. Everyone being kind and courteous to each other without crime, without anything horrible, and with plenty of excess. There are a few lines that really make you think. Robert asks Chang how come there is no crime to which he simply responds that crime originates from need and a lack of having enough. "There can be no crime where there is a sufficiency of everything." It makes you think about your life and the lives of those around you. It makes you want to strive for a world like that of Shangri-la. True we won't magically be able to live for a couple centuries or anything but perhaps if there was a little more moderation and a little more courtesy, the world would be a much better place. 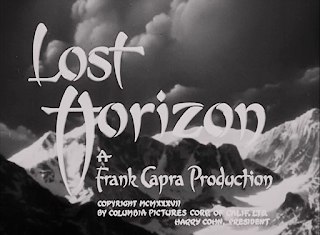 Lost Horizon is one of the few films that I've seen where your perception of what's going on changes completely once you've seen the film and know what's going to happen, and it changes for the better. I won't spoil that here if you decided not to read that one paragraph before, but you spend a lot of time wondering about two different groups of people. One of them turns out to be right and the other wrong. The revelation of which group is wrong makes you re-evaluate a lot of this movie and sheds a different light on the events. It makes you question when to apply logic and reasoning to a situation that seems too good to be true; it also makes you question what you should put your faith in. The film makes you think without cramming information down your throat and persuading you to a set agenda and that's always welcome from a movie. What's Bad Weak About It? When I start writing about the negatives of a film or TV series I ask myself "Is there something that took away from my enjoyment of the film?" 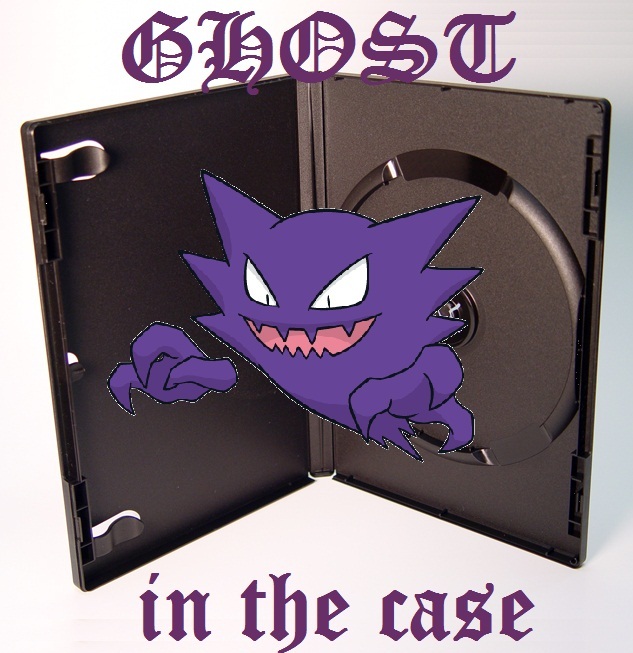 In this case no. There is absolutely nothing that really takes me out of the experience or detracts from my enjoyment of the film that I would label as bad. Since that answer is a no, I then ask myself "is there a part of this film that is weaker than the product as a whole?" Well, yes. No film is perfect and this one does have one component that is weaker though it was a deliberate choice. I was going to mention the fact that most of the female characters aren't portrayed as strongly as the male characters but that a common thing for the 1930's. But when I really sat down and thought about it, I then realized that many of the male characters weren't portrayed particularly strongly either. 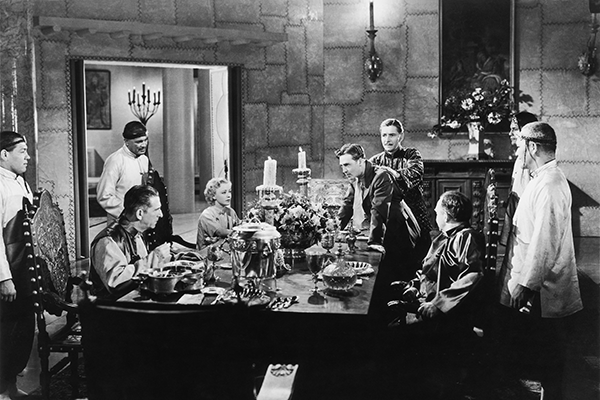 Frank Capra chose to focus more on the theme and message of the film rather than the characters because he felt that the themes were far more important than any one character which honestly FITS the theme of the movie in all reality. With there normally being so many very strong and wonderful characters that we can identify with in film it's kind of weird to see most of the characterization taking a back seat in this one. Many times characters are just there to fill some sort of role. Gloria is there to be sick, get better and not wear makeup to dinner one night and that's it! Chang is there to drop exposition carefully and not give away too much and that's it! Maria is there to take an interest in George and want to leave Shangri-la and that it! The list could go on and on. It's nothing bad because I still enjoy these characters I would have just liked for there to be a little more personality with these characters. Heck there was even a scene cut from the film where Gloria and Sandra talk and it adds character to each of them but NOPE gotta focus on that theme! Secondly we find a weak spot that's not the fault of the film whatsoever but rather the people handing the film. 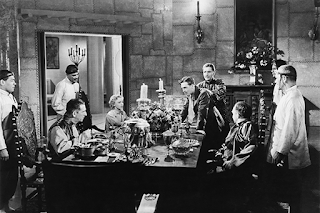 There were so many re-edits and cuts made after the film was originally released that it took people several years to track down every single scene to put back together for the re-mastering so that a modern audience could see the film as it was meant to be seen in 1937. However many of the rolls weren't stored properly or taken care of so there are some scenes even with digital mastering that just look fuzzy and poor. 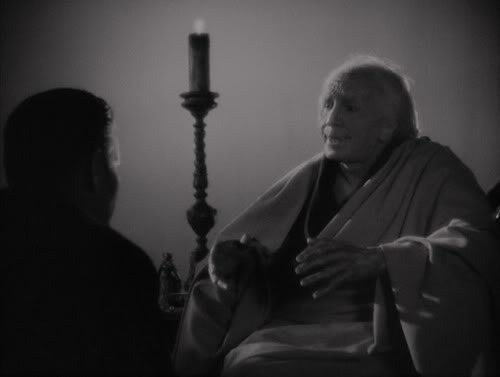 There are seven whole minutes of the film where there is no footage left only audio so they have had to re-construct it using photo stills from the time. It's not a fault with the movie it's just something unfortunate that's worth noting. Lasty, a modern audience could see this as boring. I don't see it as boring because it's something different and the theme shines through brilliantly but there's not many jokes, there's no action scenes really, there's no villain, and several scenes with no background music. There's not a lot of dramatic tension other than "What's up with this place anyway?" I find it fresh to see something that's not the normal we are used to today but I could see where some people would think it was boring. This is definitely one to check out. They don't make movies like this anymore in more than one aspect. It's a different kind of film that is more of an experience than it is following a character. Sure there's no action or a large exciting scene but it doesn't need that. It's a simple yet grand thing just like the philosophy taught in the film. It's something that you need to experience for yourself. Lost Horizon is Not Rated (it came out before the rating system was even established) and is available on DVD from Columbia Classics.